Game of Thrones has ended for the season, but summer television is starting to heat up. 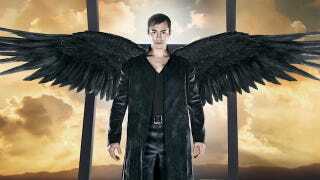 This week, we see the return of Defiance and True Blood, as well as the premiere of the angel-human war on the new show Dominion. Plus, what will Orphan Black reveal in its season finale? Check out the latest clips and details. Cat's (Kristin Kreuk) sister Heather (guest star Nicole Gale Anderson) drops by for a surprise visit at the worst possible time, just as Gabe (Sendhil Ramamurthy) suspends Cat and Tess (Nina Lisandrello) from the squad in an effort to force Vincent (Jay Ryan) out of hiding. Amelia Rose Blaire, who plays Willa on True Blood, is popping by the show this week in anticipation of True Blood's final season. Wednesday's a quiet night on this week's TV schedule. Rest up, because we've got two premieres on the books for Thursday. Beast Boy is distressed by his big new battle scar, until Cyborg convinces him that the scar makes him look tough and manly. Now Beast Boy wants to look even tougher. Defiance's first season finale was a steaming pile of shtako. Can the second season premiere turn things around? Nolan's search for Irisa leads him to "New Chicago" and "Angel Arc" Los Angeles. Meanwhile, back in Defiance, the Earth Republic appoints a charming, calculating and ambitious man named Niles Pottinger as mayor. Syfy's TV spinoff the angelic apocalyptic film Legion premieres this week, showing what humanity has become 25 years after angels first attacked the Earth. After the archangel Gabriel led the lower angel in an attack on humanity, the archangel Michael sided with humans, fighting a catastrophic war. Now the human survivors live in fortified cities—and a rebellious young soldier named Alex has emerged in the remade Las Vegas as the Chosen One, the unlikely savior of humanity. Kiera and John Doe must work together to put an end to the Freelancers. The fates of both Kira and Cosima hang in the balance in the second season finale, but it sounds like we won't be closing a chapter so much as opening a new door into the story. BBC America, please renew this show now! The war with Dyad is all but lost when Rachel's latest ploy forces a broken Sarah to concede. The Clone Club springs into action, uniting in a reckless gambit to save Sarah. As they fight to gain their freedom, Sarah encounters a new ally and uncovers a terrifying new dimension to the conspiracy. True Blood is back for its final season, and judging from the trailers, it looks like a doozy. We're looking forward to more blood-soaked mayhem—and to our own Meredith Woerner's pro/con recaps. A band of rogue H-vamps crashes the vampire-human mixer at Bellefleur's, with shocking results. As Sookie (Anna Paquin) seeks refuge from accusations that she's somehow to blame for the chaos in Bon Temps, the "one vampire for every human" plan moves forward. In the face of a vigilante insurrection led by redneck Vince (Brett Rickaby), Bill (Stephen Moyer) receives aid from an unexpected source. Sir Malcolm, Ethan and Sembene do everything they can to save Vanessa. Increase gets closer to understanding who really runs things in Salem; at the same time, Anne finds herself in danger, and in need of Alden's help, while investigating a mystery. Prepare for "Super Guitario Center."